I'm usually in a hurry at dinner time and out of habit I always grab frozen broccoli. After reading this recipe for Broccoli with Cheddar Sauce in the current issue of Cooking Light Magazine, I realized that fresh broccoli could be almost as quick. Luckily I had picked up a bunch of fresh broccoli on my excursion to Aldi's this week. Unfortunately I left the broccoli steaming a bit too long and lost some of the bright green color but it still tasted delicious. The sauce was quick and easy to make. Since I am the only one who will eat broccoli around here, I saved half of the sauce and used it to make a quick mac and cheese. 1. Place flour in a medium saucepan. Gradually add milk, stirring constantly with a whisk until smooth. Cook over medium-high heat 2 minutes or until mixture is bubbly and thickened, stirring constantly. Cook 1 additional minute, stirring constantly. Remove from heat. Add cheeses, mustard, salt, pepper, and thyme, stirring with a whisk until smooth. Keep warm. 2. Add water to a large saucepan to a depth of 1 inch; set a large vegetable steamer in pan. Bring water to a boil over medium-high heat. Add broccoli to steamer. Steam broccoli, covered, 4 minutes or until crisp-tender. 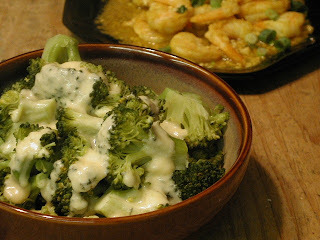 Serve broccoli immediately with sauce.